Genuine Bosch Motorsports 74mm Electronic Throttle body. Easily adapted to a custom or existing manifold when a Large Bore Drive By Wire Throttle Body Is desired. Genuine Hitachi GM LS3 90mm Drive By Wire Throttle Body. 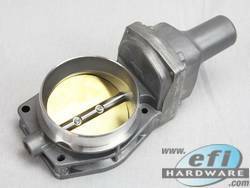 Genuine Bosch Motorsports 82mm Electronic Throttle body.